Iron Maiden have once again teamed up with Robinsons Brewery to release a branded beer. The two camps previously collaborated on The Tooper back in 2013. Now they’ve put their heads together once more and come up with Hallowed – a Belgian-style beer which will arrive in October this year. 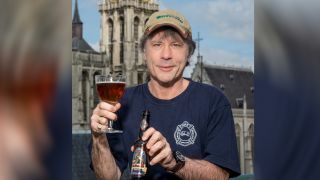 Maiden vocalist Bruce Dickinson says: “What makes this brew pretty special is that we’re adopting a Belgian yeast for the first time. I’m a big fan of Belgian beers, so I jumped at the chance to brew my own. Robinsons’ head brewer Martyn Weeks adds: “It’s all in the yeast. Belgian yeast yields a very distinct taste and presentation. You can sniff out a Belgian beer simply from its aromas: fruity, spicy and earthy. Hallowed will be bottled at 6.0% ABV and will be available from October for a limited period of just four months. Further details will be revealed in due course. Iron Maiden are currently on the North American leg of their tour in support of latest album The Book Of Souls. Find a list of their remaining shows below.